Younger selves: Snowmass 2005 participants. Many of the striking advances in particle physics during the particle collider era have resulted directly from the complementarity of hadron-hadron and electron-positron colliders. Unfortunately, it is not practical to build a complementary circular electron-positron collider for the LHC capable of reaching center-of-mass energies of about 1 TeV (tera electronvolt) because of the large amount of energy radiated away as the electrons traverse around the circular ring. As a consequence, alternate and ambitious efforts have been undertaken to develop a high energy linear collider that will not have this problem. But, in contrast to the very successful circular colliders where particles collide on each traversal, a linear collider is a single-pass machine. This creates a whole new set of challenges. Since the particles go through each accelerating element only once in a linear collider, the radio frequency (RF) accelerating cavities must both have high gradients and be very efficient at transferring wall plug power into beam power. Also, since the electrons and positrons only cross each other once, the beams must be focused to extremely small (a few nanometres) beam spot sizes at the interaction point in order to achieve high collision rates. The plan to build a linear collider motivated ambitious R&D programmes in the 1990’s at SLAC in the U.S. and KEK in Japan on technologies for a room temperature linear collider, and at DESY in Germany for a low-temperature machine. Both programmes proved successful and the International Committee for Future Accelerators ICFA then took the responsibility of choosing which approach to pursue through creating an International Technology Review Panel (ITRP), which I chaired. 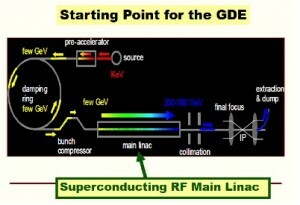 The ITRP process led to the choice of the low-temperature technology using superconducting RF cavities, and ICFA then asked me to become the Director of a Global Design Effort (GDE) to coordinate the R&D and design of a 0.5 – 1.0-TeV linear collider. I officially became the Director at a meeting at SLAC in March 2005, the GDE was born and we published the first issue of Newsline, including a Director’s Corner on 18 August 2005. I reported on the ILC/GDE design concept to HEPAP in May 2005. The first meeting of the GDE was at Snowmass 2005 where we set out our goals and plans. We agreed on plans to create an early conceptual design and then proceed to a technical design for the ILC. We coordinated the worldwide R&D programme, worked with experimentalists on the machine parameters, interfaces, as well as the concepts for the interaction region. We ambitiously set a goal of accomplishing a Technical Design Report within about five years, publishing a Refernce Design Report in 2007 and an Interim Report in 2011. It actually took us two years longer, due to financial cutbacks in 2008 and some of our own delays. The final product (TDR), underwent a rigorous year-long series of international technical and cost reviews before being officially released in June 2013. The follow-on Linear Collider Collaboration (LCC), under Lyn Evans is continuing the R&D and design programmes and is facilitating the Japanese interest in hosting the project. The discovery of the Higgs boson has given the ILC a big boost, as detailed measurements at the ILC both at Higgs threshold and higher energies can uncover the underlying physics of this totally new and important phenomenon. In addition, we all look forward to results from the present run at LHC, where will certainly give even further motivation and guidance for the ILC physics programme. We all await the Japanese government to hopefully make a positive decision to host this ambitious project as a part of a CERN-like worldwide collaboration. At present, the Japanese government is carrying out a review in their due diligence on the technology, costs, social impacts and reality of international collaboration. The science case for the ILC is compelling, the technical design is complete and practical, a very good site has been evaluated in Japan, and the site-dependent design is underway. The project cost is large, but it is comparable to other such large science projects like the LHC.